(CNSNews.com) - Chinese holdings of U.S. Treasury securities are 11.5 percent below their peak level which was attained in November 2013, according to data published by the U.S. Treasury. 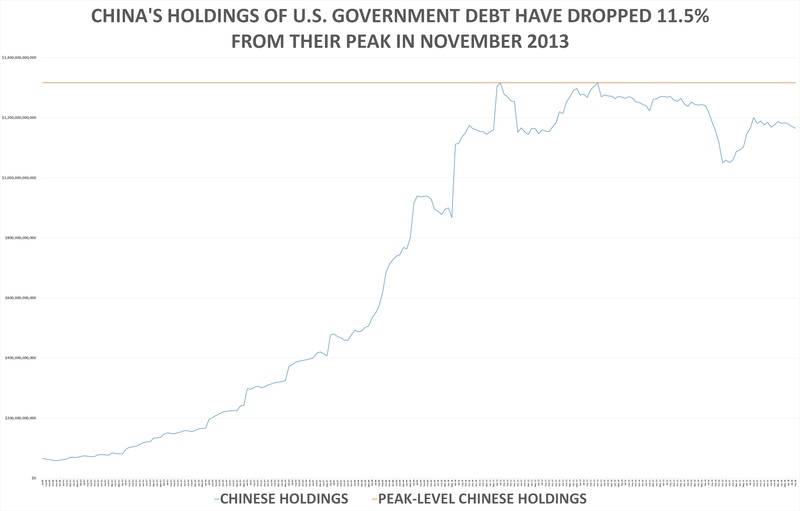 Despite that decline, China remains the top foreign holder of U.S. Treasury securities. According to the latest Treasury data released this month, entities in Japan are the second largest holders of U.S. government debt—with $1,029,900,000,000 in Treasury securities as of August. Brazil ranks a distant third with $317,800,000,000. 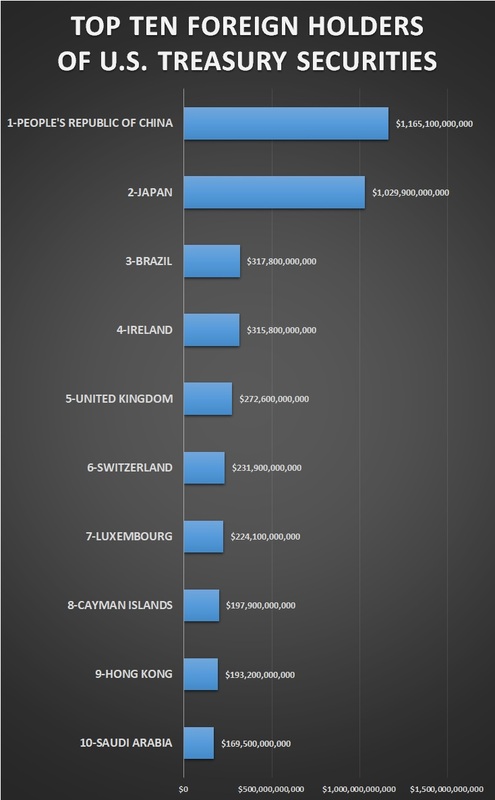 Ireland is fourth with $315,800,000,000. Saudi Arabia is now the tenth largest holder of U.S. Treasury securities. In June, it eclipsed Taiwan, which had previously been the tenth largest holder of U.S. Treasury securities. Saudi Arabia has been increasing its holdings of U.S. debt this year, while Taiwan has been decreasing its holdings. In January, Saudi Arabia held $143,600,000,000 in U.S. debt, according to the Treasury. By August, it had increased that by $25,900,000,000--or 18 percent--to $169,500,000,000. By contrast, in January, Taiwan owned $175,400,000,000 in U.S. debt. By August it had reduced that by $12,200,000,000--or about 7 percent--to $163,200,000,000.